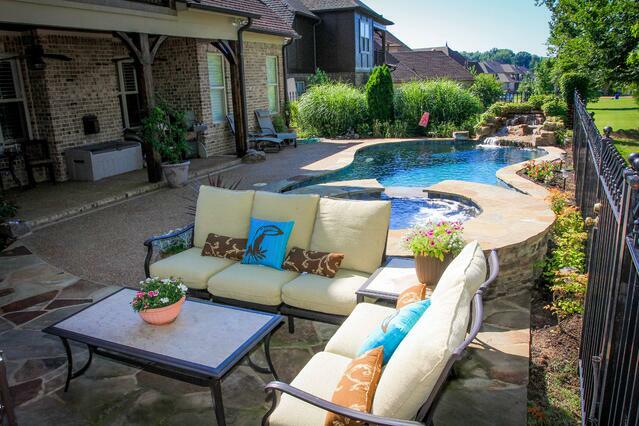 Enjoy your own tropical oasis in the Memphis area with a custom gunite pool, water feature and surrounding landscape features. Gunite pools are truly customizable and can be designed to be any depth, shape and size — which is not the case with fiberglass or vinyl pools. Our experienced design team will create the plans within the set timeframe. Once you approve the design and cost, our pool builders can start breaking ground on your custom project. We'll create a custom pool depth to meet your specific needs, along with features that will transform the space. Gunite is also highly durable and will provide years of enjoyment. You can expect to pay $80,000 or more for your custom pool. The price will depend on the size and features like ceramic or glass tiles, beach entries, waterfall scuppers and spas. We also design and install fountains for residential and commercial properties. 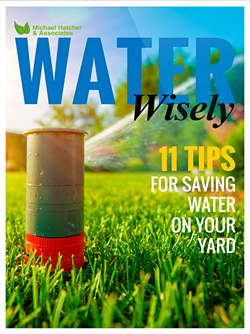 Whether it's a static water feature in front of your home or a water play area for children, these water features will add a level of tranquility and aesthetic value to any property. When you’re interested in adding a pool, fountain or pool house, set up a free consultation with Michael Hatcher & Associates. The initial meeting will take about an hour, and we’ll talk to you about how you want to use the space, your preferences, budget concerns and your timeline. Design work starts at about $400. Our experienced design team will listen to your specific wants and needs to develop a unique and creative pool plan. Once you approve the design and cost, our pool builders can start breaking ground on your project. 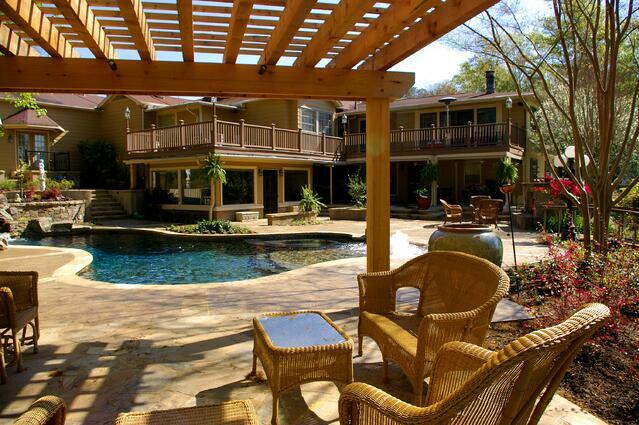 Why Choose Michael Hatcher & Associates as Your Pool Builder? 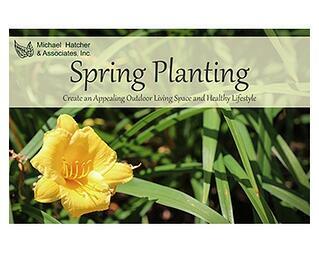 At Michael Hatcher & Associates, we’re not just pool builders. Actually, most of our pool projects are part of a larger project, such as also installing a patio, pool house, landscaping, retaining wall and irrigation system — and we can handle all of those projects in-house. Instead of having to deal with various contractors and subcontractors to create a complete landscape and pool project, you can talk to one point of contact with Michael Hatcher & Associates. Have a question about the pool’s progress or maybe want to change out one of the plants? We are your source for it all. 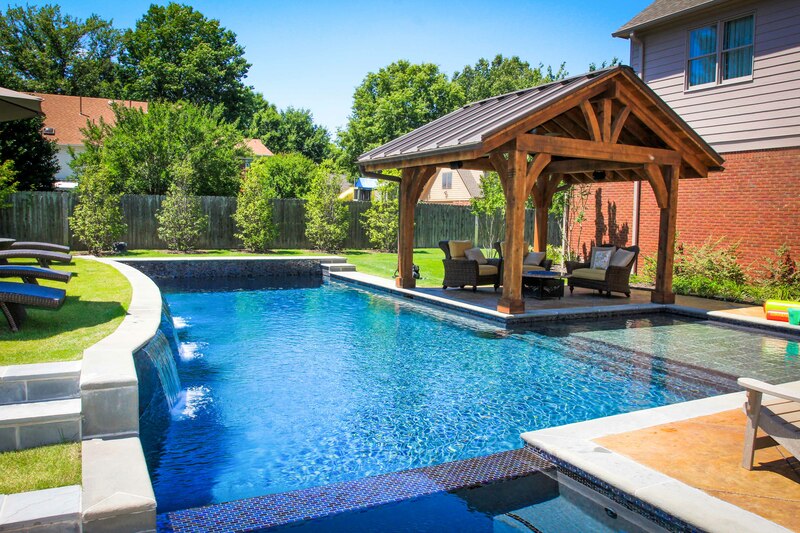 Michael Hatcher & Associates is a licensed general contractor and pool builder in Mississippi, Tennessee and Arkansas, and we also have one team member who is Genesis 3 Certified. This designer, Stephen Shikle, went through a rigorous educational program focused pool design and construction and then earned a certification for his achievement. Michael Hatcher & Associates services cities including Memphis, Collierville, Fayette and Germantown, Tenn.; Olive Branch and Southaven, Miss. ; and areas in Arkansas. We cover Shelby and Tipton counties in Tennessee; Crittenden County Arkansas; and Benton, Desoto, Marshall, Tate and Tunica counties in Mississippi. Contact Michael Hatcher & Associates at 901-755-3207, or fill out the form to see how we can enhance and improve your landscape. Create an appealing outdoor living space and healthy lifestyle. "The before and after pictures are stunning. The designers transformed our yard into an outdoor room." Since opening its doors in 1986, Michael Hatcher & Associates has become one of the most respected names in the local landscape industry.